As promised yetserday, I am writing today's blog post about why I am thankful that Eric and I had our first real, full-fledged argument. Might sound strange to you. But I mean it. I'm so glad we had our first argument because now I know we can argue and make it out in one piece. Maybe even better than when we started. Comparing the relationship I have now with the one I used to be in is like comparing apples to, well, cow dung. But, it can't be helped. It's my only real frame of reference for the way I interact with another person in a relationship. Truth be told, I have felt, for a long time, like a dismal failure at relationships. Even a year ago, when my previous relationship had been over for a couple years and I'd had time to reflect, get my bearings back and stand on my own two feet again, I still felt like a failure at being with someone. Even when I knew everything that had gone wrong had not been entirely my fault, that there were factors simply beyond my control, I still couldn't quite convince myself that I would ever be any good as a girlfriend. I figured I would spend my life pretty much alone and I even convinced myself that I was good with that. And that is the real shame. I had written myself off as a lost cause. And, in turn, had pretty much closed myself off, too. And then I met Eric. We had our first date on September 9th last year. And within the past year, I've realized something I have never known until now: I can be good with someone. I can be good for someone. I cannot express to you how very refreshing it is to know this after a 10 year relationship that seemed to prove exactly the opposite. It's exhilarating! But, as I said in yesterday's post, we finally had a tiff (aka: a lover's quarrel). It was horrible while it lasted. Hurt feelings and terse words. And, of course, there were the necessary capitals and exclamation points required for yelling via text! lol. But, the funny thing is, it never got worse than that. There was one point in my texting frenzy that I made a typo, omitted a word, and accidentally called Eric an idiot. In reality though, I had meant to say I was not an idiot. It got lost somewhere in the translation. Kind of like when you start talking so fast you mess up your words. My fingers got behind my brain a little! Lol. But, other than this one little oopsy, we didn't call each other names. No one got called crazy, bi-polar or schizophrenic either (much to my relief) and neither of us harbored any hard feelings after the fight. We took some time, cooled off, and things went back to normal. And there you have it. Did you catch that word? I just hit the nail on the head... normal. It was a normal argument. A real-live, I have a bone to pick with you kind of quarrel. The kind where you vent, let it all out, and find out you love each other just as much when you're done as when you started. The kind that doesn't crush you into feeling like you're nothing because it turned so ugly and wasted every ounce of energy within you. The normal kind, where you don't end up having to leave in the middle of the night because you just can't take anymore. A regular, old, run-of-the-mill argument. Not exactly what I'm used to, that's for sure. But, guess what? I talked to him. We both apologized. We started joking again and we said I love you. And that was it. We were done. He hasn't once made me feel bad about it. I haven't had to live with any repercussions. I argued with him because my feelings got hurt. And we're still okay. More than okay, because I feel like we've just cleared a hurdle. Or, maybe better put, like I've just cleared one. Perhaps I've never felt more normal in my life! So this, my friends, is the moral of my story: I'm grateful we argued on Monday because I've never felt so relieved. Relieved to know we don't have to see eye to eye all the time. We don't have to agree on everything. And we're both wonderfully, normally human. We make mistakes, overlook things, aren't always perfectly in tune with each other's feelings, wants or needs. We may even argue about these things. But it won't be the end of the world. It won't be like it was before. An argument won't break us into tiny little pieces because I'm not broken anymore and because we have a strong foundation to begin with. I've learned I am capable of the real deal: a relationship that is completely normal. Slightly imperfect, beautiful and wonderfully amazing at the same time. Anyway, back to the story. I was expecting an apology about something that happened (rather, didn't happen) on Sunday. But, instead, I got the above mentioned I didn't mean to hurt your feelings line. Mistake numero uno. (And, Eric, I hope you're reading this, because you could stand to read these guidelines! lol) So, instead of feeling better, I felt worse. I spoke with Eric on Monday morning before work and, of course, in the true fashion of women everywhere when they get something under their skin, I didn't talk to him about being hurt/angry. I was, instead, short and flat in our conversation. (Mistake numero 2. And, yes, it was mine...) So, things escalated from there to the exclamation points and capital letters of our (and by our I mean, my) text messages. I remember rocking you to sleep when you were small enough to fit in the length of my arm. Evenings were my favorite times. It was just you and I, and so very quiet. I can't describe the peace I felt holding you, knowing that I was the one responsible for the whole of you. 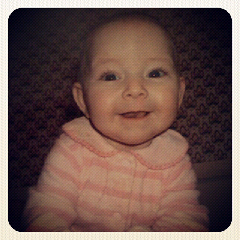 That in my arms rested a sweet, precious little person who would grow up to be anything. And my everything. I always sang to you. Something I had made up. A little melody and words for only your ears. And you would look at me so intently. Like I was someone special. And, I cannot deny, I needed that. Needed it more than I even realized at the time. You have always made me feel special. To think I had a hand in bringing such a beautiful baby into the world made me feel a little more important. More needed. More loved. And the love I felt, for you, from you, was more than anything I had known before. So amazingly unconditional. And I marveled at it, especially when we would rock in the chair together, just us two. One night, and I'll never forget it, you started humming to me. The same little tune I had sang to you for seven months while we rocked in that very chair. I was in awe. After all, you really weren't very old to have memorized the tune. But there you were, humming it back to me. The same song I sang to you to make you feel loved and safe. And it occurred to me that I wasn't at all sure anymore if I was making you feel loved and safe, or if you were doing it for me. All the months I had held you, cherishing our special evening time together, you were actually the one holding me. Holding me together while other things unravelled around me. Providing me a peace that kept me whole. For with you there to love and depend on me, I couldn't fall apart. You were my reason for strength, when it would have been easier to have given up. My baby girl, I cannot thank you enough. For being my saving angel, just by being born. One day, when you are grown, when you understand better the things that happen in a woman's heart, and understand that two people together can simply go so very wrong, I hope you will know how much you gave me when I had nothing else. And I pray that I return to you each day of your life the love you showed to me when I needed it most. Happy seventh birthday Keara. 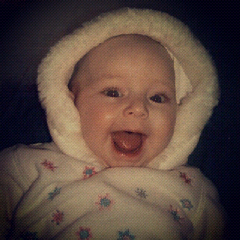 My darling baby girl. Forever the light of my life. I am tired and can't sleep. I took a long hot bath and I'm drinking some wine. Plus, I've just had a pretty busy week. But, I cannot seem to get myself wound down. I think I might know the reason: I have something to get off my chest. I've just finished off an amazing week. One that's always full of bustling activity, late nights and early mornings, lots of greasy fair food, stinky crap (literally) and noisy animals, and boatloads of responsibilities. But none of these things compare to the wonderful people who surround me during fair week. The laughs and fantastic times we share are so wonderful that I cannot even describe what a high it is. I know I've already blogged about the people that I know and love at the fair. But I just can't help it. I have to say again what a joy it is to work with this group of people. Things get crazy and hectic and we get so fantastically tired, but somehow we manage to keep our spirits high and our humor over-flowing. I would hate to give this up. But, after this week, I'm reminded how much I love doing this. I literally love being a part of the fair. I have such a great time and have made so many wonderful friends. Friends who make me laugh. Friends who are there for me when I cry, and help me out when I need a hand. And those kinds of people can be pretty hard to come by. And, I cannot deny, I like the responsibility. I thrive on it. I feel like I'm an integral part of something important. Even with the inherent headaches that come from being on a board of directors, no matter what the organization might be, I like what I do. I could do without the 'politics' but, like I said, it comes with the territory. Fortunately, though, there are enough people to counteract the negative aspects of this position. There are people who whole-heartedly care about the fair. That want to see it succeed. Who aren't a part of it for the title or the resume point. I think I fall into this category. And I know my friends that I mentioned earlier do as well. But I can hardly be blamed. It's been quite a week. It's fair week, after all. And, for those of us who help there, that means a lot of late nights and early mornings. Being home by midnight actually constitutes an early night compared to most during this busy week. There's just so much to do. And it can be exhausting. But, the truth is, even though my legs feel like lead, and I can hardly get my eyes to open in the morning, working at the fair is so much fun! I really enjoy what I do down there and I'm glad I chose this great place to volunteer my time. The main reason I love it so much is the camaraderie that most of us have down there. I love the group of people I work with at the fairgrounds. I love the devotion they have and the humor that fills the atmosphere. Especially at night when we all get a little more chatty and a lot more goofy, mainly because we're all so darn tired! But, who cares about sleep. It's overrated anyway! The great times I've had down at the fairgrounds in the last few years are well worth a week or so of running on empty. Last night at the fairgrounds, we paid tribute to a man who was, in a lot of ways, the personification of the Kent County Youth Fair. Ron Wenger was the man most people thought of when they thought about the fair. He was, typically, ever-present at the fairgrounds. Not only during fair week, but most times. You would usually see his truck parked down there and he'd be tinkering around with something or another, wearing his hat and signature plaid shirt. No matter when I would show up to work on something for the fairboard, he was there. And usually ready with a good story to tell while I sat at my desk doing the tedious work that is bookkeeping. :) He made the evenings enjoyable with his good humor and camaraderie. We would laugh about the stupidest things while I wrote checks for the fair. I loved his whacky sense of humor and I think he kind of liked mine, too. Or we would hash out some dilemma or another while I worked on a report. Over a short time, we became friends. Even more, he became like a father to me. He worried about things that I was dealing with, and tried to come up with ways (some of them pretty out-there. lol) for me to change what wasn't going right in my life at the time. In short, he cared about me. And I about him. When it became evident that something was going on with Ron's health, we all grew more and more concerned. And as the weeks passed, we could see that his condition, unknown at the time, was deteriorating.When it was discovered that he had ALS (Lou Gehrig's Disease) we were all heartbroken. It wasn't long after that diagnosis that he left us. And when he did, he left a big hole. Not only at the fairgrounds, but in our hearts as well. 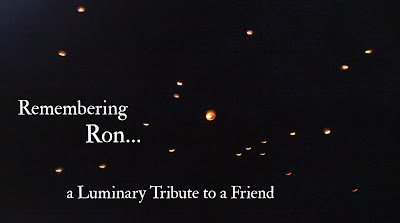 In memory of Ron, some people who also loved him here at the fairgrounds decided to have a luminary tribute to him during fair week. The luminaries were given out last night with a donation, all of which is to be donated to the ALS Association in Ron Wenger's name. The night couldn't have been nicer for this beautiful tribute. 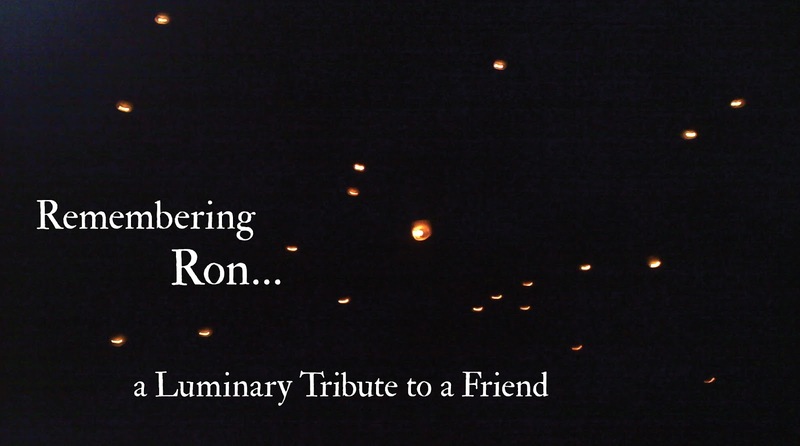 And watching the lanterns float up in the sky was a peaceful, moving sight. My daughter was with me last night. She wanted to light one for Ron and for her grandma, my mom, too. She asked, in a true innocent child's way, "do they float all the way up to heaven?" I told her that they just might. But, in reflecting today, my answer is yes. I know they do. They float right on up to heaven full of the love we still have in our hearts And the souls of the people we love and have lost shine all the brighter for it. Friday morning. I should be thrilled. The work week is over. The weekend is ahead. But, honestly, this feels more like a Monday morning to me. There's just too much stuff wearing me down to get excited about a weekend. And isn't that just a bummer? Then I went a little crazy and got the curling iron out. It isn't something I do just everyday. Usually I blow dry and go. And thank goodness I've got a cut that allows me to do that. Because, let's face it, I usually don't have the energy for much more. Being a girl has its ups and downs. Emotional, hormonal & physical. Sometimes all at once. And, regardless of gender, we all have our own stress and issues to deal with. Just part of being human. So, we learn to roll with the punches. And, typically, we all do a pretty good job of it. 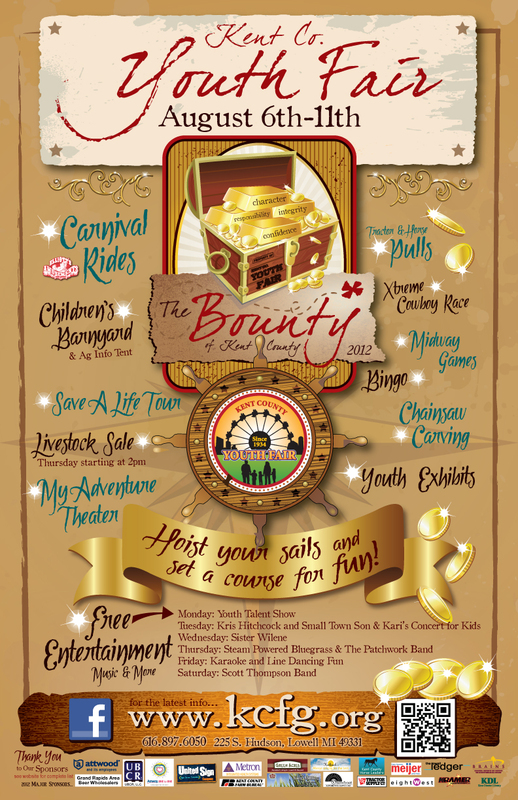 The Kent County Youth Fair is only a few days away. Hard to believe for those of us behind the scenes. But true nonetheless. It will be here before we know it. Ready or not! But, I'm sure everything will be ready just as it needs to be, thanks to the group of devoted people who put their hearts and souls into this effort. A lot of volunteers and employees work hard to bring fair week together. And I'm thankful for all of them today. But I'm especially thankful for a handful of people who put in a lot of extra hours, not just directly prior to fair, but long before everything has come together. Their legwork insures that everything will, indeed, come together. They are a special bunch. And I want them to know they are appreciated. Not only am I thankful that they work so hard. I'm thankful, too, for their passion. They enjoy the work they do to ensure a succesful fair because they enjoy the outcome. They honestly believe that the Fair is a great resource for teaching kids responsibility and leadership, character and integrity. And it's because of this passion that they deal with the inevitable snares and hiccups and headaches that usually accomodate any event. With so much to do and prepare for, there is never a dull moment! Being surrounded by enjoyable people is a definite plus in any situation. But being surrounded by them during a hectic time is a MUST! There's enough humor among this group of people that, even if one of us gets temporarily negative, or just gets so plain tired that we can hardly function anymore, you end up being back in a good mood in no time. All it takes is some off-the-wall comment and you're smiling and giggling again. These people are positive, and they're just downright comical, so we have a great time, even while we're working our butts off! :) If that's not something to be thankful for, I don't know what is! Fair begins next Monday, on the 6th. This crazy bunch of people (who love the fair with all their hearts) will be there, possibly acting a little insane, most likely laughing about something ridiculous. But we'll be there and, gosh darn it, we'll be having fun! And so will you when you visit the Kent County Youth Fair. 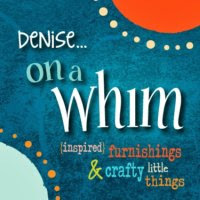 Check out the full schedule of events at www.kcfg.org. Hope to see you at the Fair!